Germany v Saudi Arabia was the last test for both sides ahead of the 2018 FIFA World Cup in Russia, which will kick off on Thursday and die Mannschaft will travel to Russia with some work to do after stuttering at times against the Green Falcons. Germany win after five winless games. Saudi Arabia score their first ever goal against Germany. Germany are now off to Russia. As expected Germany took control of the match from the getgo by pressing high allowing the Green Falcons no room to get out of their half and as a result, the fans of die Mannschaft did not have to wait long for the first goal. 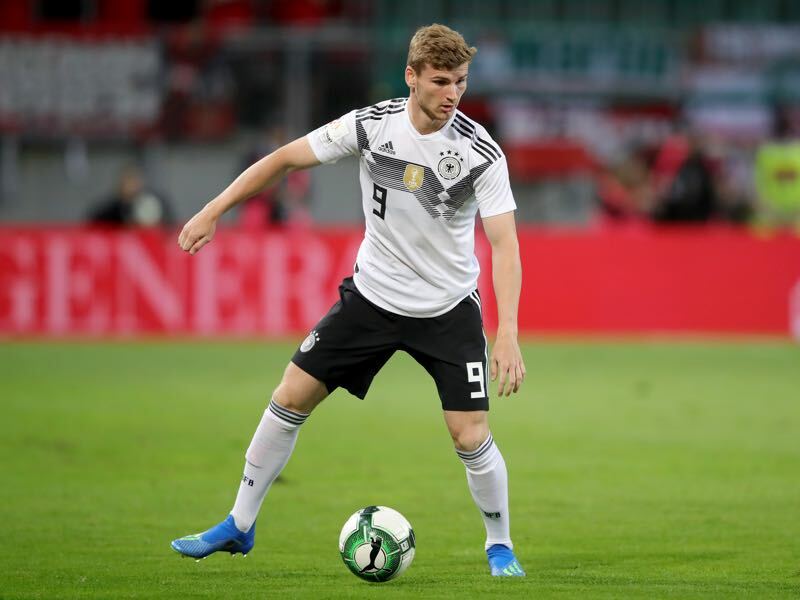 In the eighth minute Toni Kroos played a long ball to Marco Reus, who had escaped the defence, and with plenty of room inside the area, it was easy for him to lay off the ball to Timo Werner. Free inside the six-yard box Werner made no mistake to score. Germany kept coming, Marco Reus had a ball hit the post (11′), and Sami Khedira saw a curled shot from 20-yards go wide (15′). 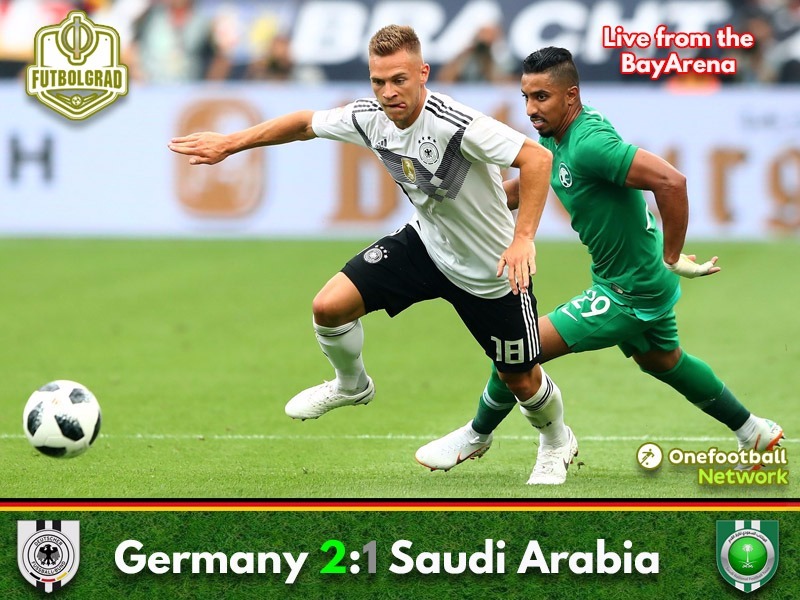 Die Mannschaft were snatching at their chances, and while Saudi Arabia were lucky to be still in the match, the Green Falcons were starting to find opportunities to break out of Germany’s stranglehold. Germany’s keeper, Manuel Neuer, was forced to leave the area on several occasions to intercept counters by the Green Falcons. What was, however, a good test for the keeper, after months without any matches, was not what Germany fans expected as the BayArena fell quiet in a weird mix of anticipation and impatience with Germany’s play. Germany did finally awake from their slumber in the 37th minute with Khedira failing to beat Al-Mayouf with a shot from close distance. From there Saudi Arabia quickly countered and almost scored the equaliser, but Al-Muwallad’s shot from 16-yards failed to hit the target. Germany needed a goal to settle the match down and when the Saudi defender Omar Othman deflected a cross from the left into his own net Germany were finally on course. Germany started the second half with a double chance. Joshua Kimmich had a chance blocked in the 47th, and Mats Hummels missed the target with heel on the ensuing corner kick. Two minutes later, Julian Draxler, had a shot from outside the area stopped by keeper Al-Muaiouf (49′), and Müller also failed to beat Al-Muaiouf with a shot from outside the box (54′). Frequent substitutions and the crowd booing Gündogan (see below) took out some of the tempi of the match. Without a doubt Germany seemed somewhat distracted at times – perhaps it was also a conserving of energy ahead of the World Cup. Hence, it was not until the 73rd minute that die Mannschaft broke forward with Draxler once again being stopped by the Saudi keeper. Then with seven minutes to go Saudi Arabia had the historic chance to score their first ever goal against Germany. Al-Jassam won a penalty after interlacing his boot with Sami Khedira’s foot. It was a questionable penalty at best, which was then led to a goal after Al-Sahlawi’s shot was stopped by ter Stegen, Al-Jassam, however, converted the shot after handling the ball visibly with his hand. With just seconds to go the Green Falcons had a historic chance to make it 2-2 but instead of making 2-2, they were looking for an extra pass, allowing Germany’s defence to clear the ball. It was the final chance of the match as Germany stuttered to a win. Timo Werner was the man of the match against Saudi Arabia. The RB Leipzig forward scored the opener and then also created the second goal of the match with a fantastic low cross that was diverted by a Saudi defender to create the winner for die Mannschaft. In the 57th minute, Ilkay Gündogan was brought on for Marco Reus. The “fans” of die Mannschaft reacted with loud boos to the substitution. It appears the incident in which Gündogan, together with Mesut Özil, had met Turkish President Recep Erdogan had not gone down well with the Germany supporters. Joachim Löw reacted by gesticulating to the fans to stop booing and applaud the substitution. It will be interesting to see how much of an impact Erdogangate will have on die Mannschaft ahead of the World Cup. Germany end a run of five winless matches. Germany also remain unbeaten against Saudi Arabia. Al-Jassam’s goal was the first ever scored by Saudi Arabia against Germany. Marco Reus gave his first assist in the national team shirt in 1736 days – his last assist came in September 2013 against Austria.